FDR court-packing plan: Obama and Roosevelt’s Supreme Court standoffs. When the Supreme Court willfully misreads the Constitution, FDR’s plan doesn’t seem so bad. 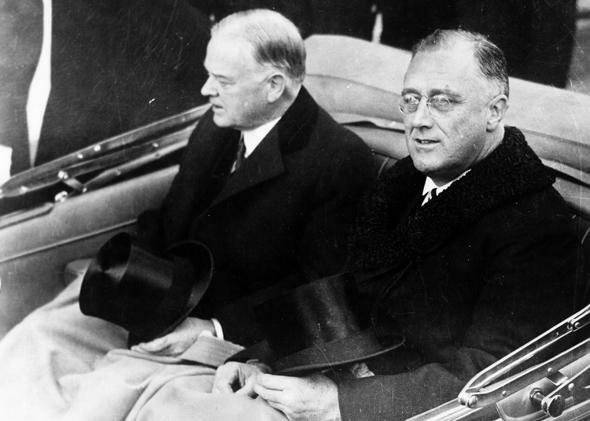 Franklin Delano Roosevelt and Herbert Hoover on way to the U.S. Capitol for Roosevelt’s inauguration, March 4, 1933. A Republican president presides over a historic economic collapse, allowing his Democratic opponent to win the White House in a walk. Once inaugurated, the new president signs into law a mix of emergency legislation intended to goose the economy and long-term reforms to benefit the least fortunate. The new president is soon besieged by a strident opposition, backed by some of the wealthiest people in the nation, who insist that our Constitution is being sacrificed on the altar of socialism. Before long, the president’s signature accomplishments are threatened by conservatives on the Supreme Court. I’m speaking, of course, about the presidency of Franklin Delano Roosevelt. If you thought I was speaking about a more recent president, the truth is that FDR’s domestic achievements faced far greater threats from the Supreme Court than President Barack Obama’s. Sadly, however, there are early signs that today’s court may be headed to a similar, deeply partisan standoff with the president of the United States. In his first five years in office, Roosevelt squared off against a Supreme Court with little patience for the New Deal—or for many other efforts to protect the vulnerable. As I lay out in my book, Injustices: The Supreme Court’s History of Comforting the Comfortable and Afflicting the Afflicted, these justices were committed to a misreading of the Constitution that, among other outrages, doomed children as young as 6 to lives working in cotton mills and coal mines. Roosevelt’s plan to teach humility to these justices became known as his “court-packing” plan. It is widely viewed as one of his greatest blunders. The plan, which called for up to six new justices to be added to the Supreme Court, emboldened Roosevelt’s foes and persuaded many lawmakers to become his foes. Sen. Hiram Johnson, a progressive Republican who supported the New Deal, claimed that the plan placed the nation on the “road to Fascism.” Rep. Hatton Sumners, the Democratic chair of the House Judiciary Committee, turned to a group of his colleagues after learning of the plan and announced: “Boys, here’s where I cash in my chips.” A Gallup poll showed 53 percent of the nation opposed to it. This opposition is understandable, as an independent judiciary is a precious thing. The courts are the one branch of government that anyone, whether rich or poor, can approach seeking relief and have their grievances considered by powerful government officials. At their best, judges can stand up to discrimination and protect each American’s most basic rights. Such independence is not something to be traded away lightly. But this was not the sort of judiciary that confronted Roosevelt. When Roosevelt was still a young man, the Supreme Court backed segregation in its infamous Plessy v. Ferguson decision. Nor did the courts prevent the very kind of executive and legislative overreach one would expect them to thwart. During the Woodrow Wilson administration, which Roosevelt served in as assistant secretary of the Navy, the judiciary ignored the First Amendment and blessed laws criminalizing dissent. (Under one Wilson-era law, the mere act of displaying a German flag could be punished by 20 years in prison.) Five years before Roosevelt’s election to the presidency, a nearly unanimous Supreme Court permitted a surgeon to cut a woman open against her will and remove her fallopian tubes. Roosevelt, it should be noted, was no civil libertarian—and he certainly was no crusader for racial justice—but the president’s court-packing plan would not have endangered the Supreme Court’s legacy of standing up for individual rights because that legacy simply did not exist. The justices of his era, to the contrary, showed little interest in protecting the rights that are actually enshrined in the Constitution. Instead, many early 20th-century judges followed a path laid out by a legal scholar named Christopher Tiedeman. He taught that judges must defend “the conservative classes” from “an absolutism more tyrannical and more unreasoning than any before experienced by man—the absolutism of a democratic majority.” Indeed, according to Tiedeman, a judge’s job was to “lay [his] interdict upon all legislative acts” that violated a narrow laissez faire vision of society, “even though these acts do not violate any specific or special provision of the Constitution.” Judges must protect entrenched power, even if there is nothing in the Constitution permitting them to do so. The Supreme Court’s early 20th-century decisions were profoundly arbitrary, and they relied on distinctions with no grounding in the text of the Constitution. The justices permitted laws limiting the number of hours worked by miners, but they forbade limits on the hours worked by bakers. Though they forbade many labor laws protecting men, they permitted nearly identical laws protecting women (although this willingness to tolerate laws protecting women was short-lived). In one of the most infamous decisions of the era, the justices ignored a line of cases establishing that Congress could regulate which goods are sold across state lines to hold that this power could not be used to block the sale of goods produced by child labor. So, when Roosevelt announced his court-packing plan, he wasn’t confronted with a choice between a judiciary that was committed to upholding the Constitution and one that would simply provide a rubber stamp for the New Deal. He choose between a nation subject to the arbitrary desires of five unelected men in robes and a nation governed by men and women elected by the people. Given two distasteful options, he picked the lesser evil. I conclude in Injustices that this outcome was for the best. Congress can pass civil rights legislation, but courts are needed to apply it in individual cases. Congress can ban child labor, but courts are needed to sanction the individual employers that defy this ban. The basic human rights protected by the Constitution—the right to free speech, the right to a fair trial, the right to be free from unjust discrimination, and so forth—are essential freedoms. And, as the darker moments of American history demonstrate, these rights will not always be respected by elected lawmakers acting without supervision. King is the latest legal attack on the Affordable Care Act. It relies on a few words of the law that, if read out of context, seem to suggest that billions of dollars worth of tax credits intended to help people pay for their health insurance are unavailable in nearly three-dozen states. If this lawsuit succeeds, it will plunge many states’ health insurance markets into chaos and potentially strip health care from 13 million or more Americans. Nearly 10,000 preventable deaths will occur every year if the Supreme Court sides with the plaintiffs in King. As Greenhouse explains, four of the court’s five conservatives previously rejected the view that a few words of a law may be read out of context—as Justice Clarence Thomas once wrote, courts must look at “the language itself, the specific context in which that language is used, and the broader context of the statute as a whole.” Another court conservative, Justice Samuel Alito, wrote a decision suggesting that the King plaintiffs’ reading of Obamacare violates the Constitution. So if this were a normal case, rather than a challenge to a law that is loathed more than any other by Republicans, the Obama administration would win the case in a walk. A decision favoring the plaintiffs in King would mirror past decisions striking down laws against child labor. It would inflict needless cruelty on millions of the most vulnerable Americans, and it would do so with no basis in law. It would also raise serious doubts about the impartiality of the Supreme Court. Undermining Obamacare is the Republican Party’s top policy priority, and all five of the justices who are most likely to vote with the King plaintiffs are Republican appointees. If the justices are willing to cross this line once, it is likely that they will be willing to cross it again and again. A future president, in other words, could confront a dilemma that no president has faced since Roosevelt.